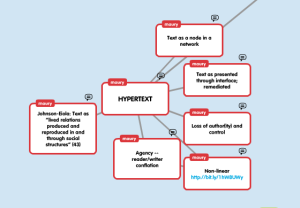 This entry was posted in ENGL894networks, Mindmap and tagged hyptertext, mindmap, social action. Bookmark the permalink. Same comment as before…however, Im wondering if you think about it in terms of Rhet/sit if it makes the situation better or worse. I’d argue the “point” of these is to be writer focused (the primary audience being you at different points in time); however, because it is publicly available your fears from lack of control are still there (still rhetorical fears though, yeah? ).